The quality of your homebrew can be dramatically improved by making a yeast starter. Home brewers often toss a packet or vial of yeast into their beer without much thought to the quantity needed. Though modern liquid brewer’s yeast smack packs and vials are a huge improvement over older dry yeast packs, these packages do not contain enough yeast cells for optimal pitching. Underpitching results in slower startup, higher risk of infection, off flavors and sometimes incomplete fermentation. In general, lagers require a larger starter than ales. George Fix’s book “An Analysis of Brewing Techniques” recommends pitching rates of 0.75 mllion cells an ale and 1.5 million cells for lager. The number is measures in million of cells per milliliter per degree plato. Converting to homebrew units, his ale figure translates to 4 billion cells per point of original gravity per 5 gallon batch (1.048 original gravity would be 48 points or 192 billion cells). For a 5 gallon homebrew, lets use the figure of 192 billion cells. An average White Labs yeast vial contains around 100 billion cells of active yeast. Therefore without a starter, you would need two yeast vials to reach optimal pitching for our 5 gallon example. The large Wyeast activator packs contain around 100 billion cells as well, so again you would need two packs. The smaller smack packs contain only 15-18 billion active cells, so you would need 11 for the same 5 gallon batch. (Ref: MrMalty). Keep in mind you would need to double the above figures for a lager. Creating a starter is very easy. 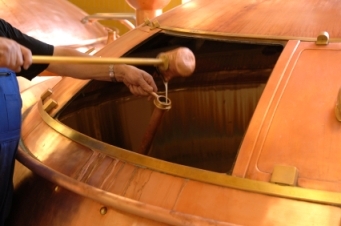 You want to start 18-24 hours before your brewing session, so the yeast can reach an active state before pitching. If you are doing a two stage starter, allow 18-24 hours for each stage. I use a large pyrex flask, but a very clean pot is a suitable substitute of you can cool it quickly. Dry malt extract is easy to store and use in small quantities. To determine the amount to add, you can create a mini-recipe in BeerSmith that is the size of your starter and adjust for a target gravity of around 1.040. Alternately, use this rule of thumb: between 3.5 and 4 ounces of extract per liter (or quart) will give you a good starter. Allow the starter to ferment between 18 and 24 hours. Pitch the entire contents of the starter into your batch of beer to get an active, robust start. Pitching yeast at the proper rate will significantly reduce the lag before active fermentation begins, promote complete fermentation, reduce the risk of infection and improve the overall quality of your beer. Thanks again for dropping in – feel free to leave a comment, subscribe or drop a guest vote using the BrewPoll button on the right. when using the Starter tab in BeerSmith 2, I don’t understand how much malt extract I should add. I only see the starter volume per se, but not the volume of malt extract to add. Just one note – your starter should not have an airlock since it needs an abundance of oxygen to propagate. The standard practice is to cover your flask with aluminum foil and that should be enough to keep unwanted bacteria out and allow oxygen to get in. Brad, What do you think about doing an all-grain 4 liter starter, but only using 1 liter for the first stage, while storing the other 3 liters in the fridge till 24 hours later, then reboiling the 3 liters, cooling and adding to the 1 liter starter? My main question has to do with storing the extra wort (3 liters) in the fridge for a day to pitch the next night. I brew full grain, getting 6 gal out of mashing and boil it for 5 gal. beer. Will a starter, and I need 2ltr., spoil my brew by diluting ? The instructions above omits the need to oxygenate teh wort before pitching the yeast. Slight over site but necessary. Could someone explain how to wash and reuse yeast? It is my understanding that to make a yeast starter with a stir plate you would combine half cup of DME with 2 pints of water. Boil for 10 – 15 minutes, cool below 80 degrees F and pitch a veil of White Labs yeast which the specific gravity would be approximately 1.040. My question is that if yeast multiplies in a starter up to five time the number of cells, will the basic starter ingredients listed above result in a cell count close to 500 Billion if the veil is new and contains 100 Billion. A 2 liter starter for a 5 gallon batch means you’re boiling max 4 gallons – 20% of your volume is un-hopped wort. That sounds strange. Is this enough where you need to correct for hop utilization in the boil? Any other issues using such a large volume of starter? Can you let the yeast settle to the bottom, decant off the un-hopped wort and only pour in the sludge (I mean, happy yeast)? How long ahead of time would you need to do this? A couple of days? A week?